At the rifle range, airmen and infantry, who defended the airfield, practiced their shooting skills. 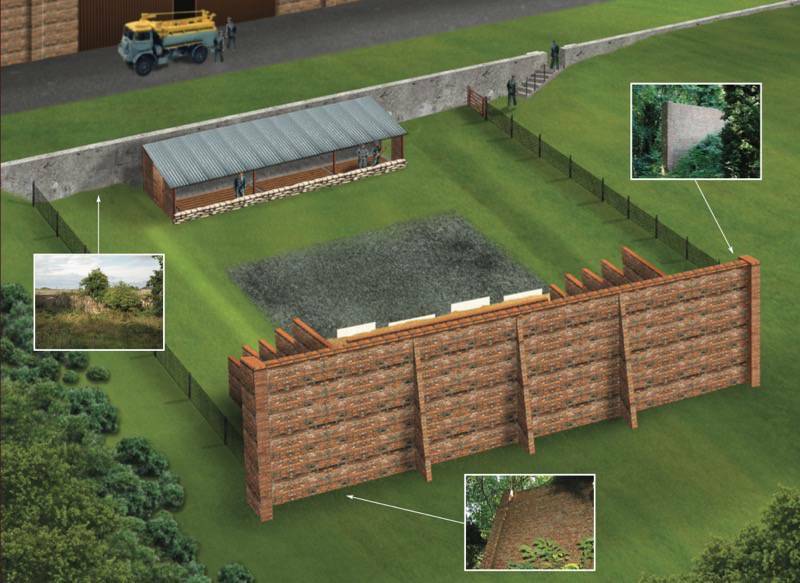 If you visit the airfield, you will see the impressive brick wall of the rifle range in the southern part of the grounds. The brick wall is an essential safety feature designed to catch stray bullets that completely miss their target. Those shooting here fired from this end, beneath a tin covered wooden awning, towards targets fixed to two parallel concrete walls in front of the brick wall that forms the back of the firing range. These two concrete walls and the hollow that once lay between them are now largely buried by sand, but you can still see some metal fixings on their inside faces where the targets were attached. The brick wall has two surviving revetments, or supporting walls, at right angles to it which also help enclose sand placed here to catch bullets fired at the targets. Originally a small brick building stood on the left where people could shelter close to the back of the range protected from bullet ricochets by an angled concrete wall (now demolished). The date the range was completed was scratched in wet mortar “29-6-28” but this is now buried. The brick wall at the far end of the firing range is in good condition for its age although the bricks facing you have suffered some damage from weathering and bullets.